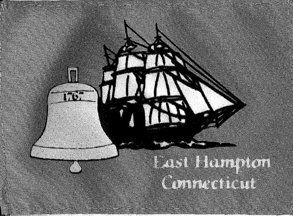 The flag of the Town of East Hampton, Connecticut, is blue with a black and white ship, yellow bell and "East Hampton / Connecticut" in yellow. Here is the flag story: "The Town of East Hampton's Flag was copyright in the Library of Congress in Volume 2395 at page 46 on September 6, 1988. It was designed by Martha Eastman for a contest sponsored by the Town of East Hampton as part of the celebration of the Bicentennial of the U.S. Constitution. The design is the property of the Town of East Hampton. Once the domain of the Wangunk Indians, and more recently "the Belltown of the World", East Hampton was incorporated in 1767 and is composed of three villages, East Hampton, Cobalt and Middle Haddam. The bell represents the fact that East Hampton was known as the bell town and was the center of the bell-making industry for the country. The oldest firm is Bevin Bros. (1830) and is still in operation. Cobalt, the second village is known for mining which began in 1762. Nickel and several other metals were found along with cobalt and mica. Middle Haddam, the third village in the town, was once important as a shipping and shipbuilding center. The flag also depicts an image of a ship, even though Maritime Glory in the record of this township is now but a memory." Information and image of the flag thanks to Sandi Wieleba, Town Clerk. "Our Town covers approximately 36 square miles, with a population of approximately 13,000 residents, with one of Connecticut's largest inland water bodies, Lake Pocotopaug at 512 acres. State parks and forests surround us on our northern, southern and western borders, along with the famous Comstock Covered Bridge across the Salmon River." - from official town website: www.easthamptonct.org/Pages/index.